Aimpoint is one finest red dot sights worldwide recognized. 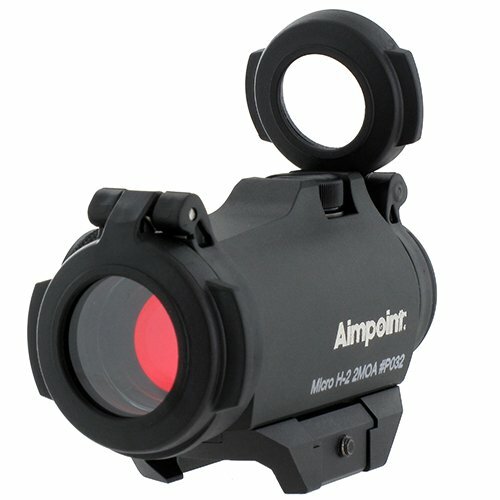 As one of the top brands, Aimpoint credits their products in use of law enforcement as well as civil defense. With a varied array of products over time, it is such an intricate puzzle for shooters to single out the best Aimpoints for AR15. We’re here to help you out in this mission. 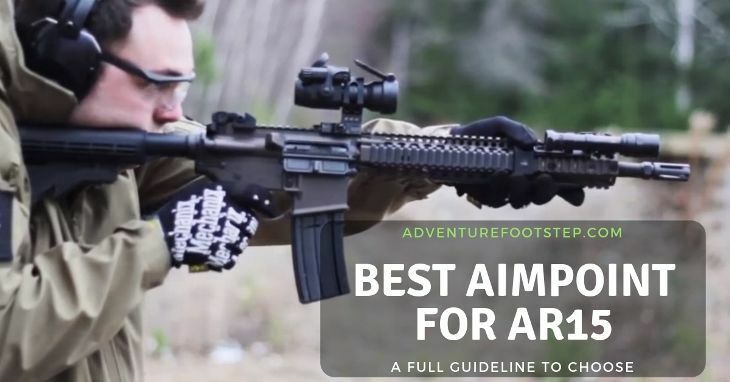 Check out our collection of the best Aimpoints for AR15, rigged and rated. Why Red Dot Sights on AR15? There is only one answer: the red dot is a faster and better sighting system. If you’re new to AR15, there should be a debate on whether you can mount the rifle with a red dot or a conventional scope. Both are fine depended on the primary purpose of your rifle. There are four categories that make a red dot the winner over the scope for AR15. The advantage has to go to the red dot sights. It is literally built for speed. If you look at the design, first of all, the optics don’t have an eye-relief. Your eyes can sit anywhere but still have a clear vision through the optic. Typically, the reticle on a red dot is visible and straightforward. It has the duty to give you more speed. Red dots also don’t have any magnification which can be beneficial if you intend to shoot with both eyes open. A major part of being able to shoot accurately is seeing. That’s how magnification comes in handy in this case. Sadly, the red dots don’t have these features, especially if you don’t have perfect eyesight. But that doesn’t mean it loses its precision. There are amazing shooters out there who are capable of stretching out the range of their red dots. Compare a 4-ounce red dot with a 16-ounce scope, the difference is obvious. If you’re looking to shave off a few ounces from your AR15, a micro red dot is definitely the way to go. At different price points, the products give different degrees of reliability. On the flip side, you can use a red dot alongside with irons installed at a 45-degree angle. That way you can optimize every aspect. Since you got the point why you should use a red dot. There are a few points to nail down before you hit the buy button. There are two main types of sights: Reflex sight and holographic sight. A reflex projects the image of the reticle onto a lens that reflects in your eyes. The holographic sight works in a similar fashion. However, the image that you’re seeing is actually a virtual representation of the reticle which is projected beyond the lens. You want to know whether you are firing in a CQB where things are close quarters or in an outdoor environment with a long distance. This is how wide the lens is in front. It ensures enough light to suffice your vision. It can be affected by sunlight that may cause glare. So, you want to stay away from any direct light that comes in contact with the lens. If you’re a high-light environment where you’re getting direct sunlight, you won’t be able to see the red dot. Look for the optic with the high-intensity adjustment to handle the condition. Though the red dot sights are already micro compared to the scopes, you may want the lightest among them. Aiming bulk-free could be one winning advantage. Some people have to mind their wallet, and that’s understandable. 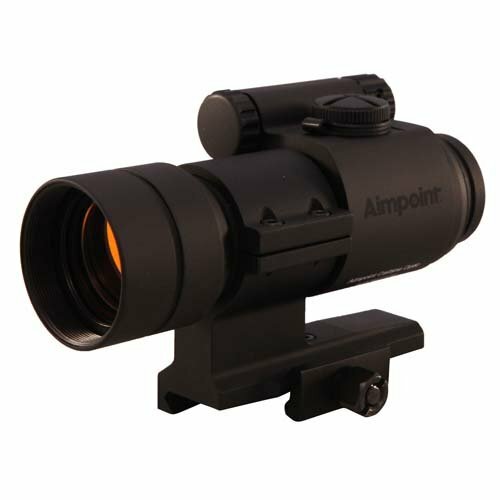 Though Aimpoint is known for the top price range, in fact, you can find really find inexpensive option down the road. Shooters come to Aimpoint would skip the price point for its quality. Nonetheless, we know the largest optics of the line cost the least. This could be the top concern when buying an Aimpoint red dot. The brand offers optics can last between 50,000 to 80,000 hours. We find it pretty comfortable at 5 years but it’s ok if you want a longer lifespan. After getting a quick revision of related information, it’s high time to jump on the best Aimpoints for AR15. This product gains its credit for high durability. The reputation is inferred in its material, including the main components of aluminum with anodized surface. It is Picatinny compatible, 30mm tub. That gives you an option to put them on any different aftermarket mounting option. ACO Sight is waterproof optic. As you expect, it is fully nitrogen purged, has all the O-rings where it needed to seal it off. It has a high resistance to bad weather and environmental conditions, though, it’s not rated to be submersible. The ACO sight employs 9 settings of brightness, but it’s not compatible with night use. This stuff supports 2 MOA dot that can cover roughly 2 inches at 100 yards. So, it’s pretty fine dot you can dial it in if you want to get some good accuracy. The item comes with a full pack of accessories like flip covers, filter, battery holders. This ACO promises to cater to nearly every requests of shooters. Obviously, this one is an upgrade from the H-1 with more features and quality. Take a look. Some caps come on both the windage and elevation. One of the lids provided is the two-prong piece you need to dial. It has a little indicator tells you which way you want your point of impact up or to the right. The huge selling point is the 50,000 battery life. In other words, you have the sight survives roughly five years on steady use. It has an adjustment knob indicates the brightness. You can go all the way from zero up to 12. Note that these are all day settings, no night vision modes. On the H-1, it doesn’t have the flip cover, but the bikini cover. So, the H2 has made an upgrade with clear glass. There is the protected top turret for elevation. You can see it has the built-up aluminum piece to prevent the impacts. We’ve noticed that the angle of the front lens looks steeper than that on the H-1. It’s probably why you have a little bit of crisp and less slash on the glass. The T2 has many steps above the T1. To us, the biggest appeals of the microdots is the super small footprint it makes on your rifle. Since the AR15 appears to be streamlined and maneuverable, putting this Aimpoint on gives it a compact. Not only small in size, but it is also small in weight. 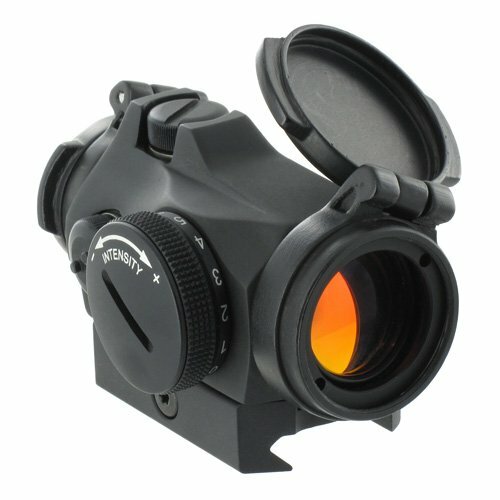 It comes with the standard Aimpoint mount, but you really can go for different variations on the market. Either for quick detach or skeletonized mounts, the sight can match it all. We combined the height with an aftermarket mount; it becomes perfect for 1/3 co-witness to go with the sight you have on the AR15. The brightness control for your red dot has 12 settings. On the side is the rubberized ring gives you excellent traction for the vision. Good news is they have rigged the night vision 1 to 4 on this optic. When you get into the mid-range like 6 or 7, it gives you 50,000 hours of battery life. So, you’re going to be able to install you cr2032 battery and get an extended lifespan. If you ever need the rifle to for that bump of the night, you don’t have to worry about it not being on. We call it a friendly-sight for self-defense. We definitely pick the Aimpoint T-2 to be the king to the hill. Its battery life of 50,000 hours is mind-blowing. The weight and durable construction add more points to the contest where T-2 grabs its spot of the hands-down winner. For the AR15, you can’t go wrong with Aimpoint product line. All you need to do is to identify your purpose and select one of the red dot sights from our list.